Written by Christopher Beaubien • July 22, 2008 • Start the Discussion! Now that Dent has become a symbol of heroism, it becomes increasingly difficult as a human being to remain pure and without flaws. 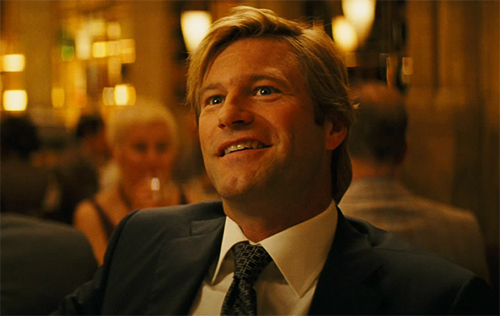 Harvey Dent encapsulates a truth that courteous people are capable of monstrous deeds, much like the Brendon Gleeson character in In Bruges (2008). 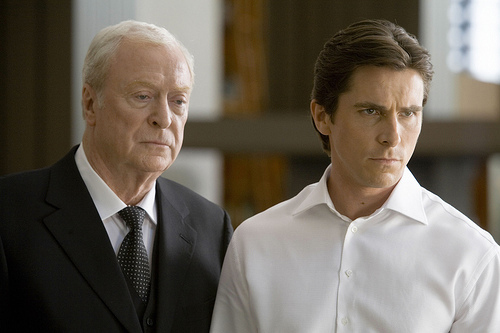 Batman supports Dent as they work with Commissioner Gordon (Gary Oldman), who has finally embraced Batman since their last encounter in Batman Begins (2005). There is a wonderful shot up on the roof of police headquarters that circulates around the three defenders next to the beaming bat-signal post all in one take. Dent and Gordon argue loudly about apprehending a money embezzler linked to the mob, while Batman stands opposite, observing them. Batman has become so integrated in this world that the suits don’t even blink at a man dressed as a bat. Christopher and Jonathan Nolan are not afraid to stray away from the technicalities of the batman universe in order to engage their own personal imaginings of their own excitably dense and layered, though always coherent and logical, means of storytelling (re: Memento, The Prestige). Just look at what they did to Barbara. Another example is of their substitution for the Batcave: an underground concrete-walled box with a gridded light-screened ceiling that extends for hundreds of feet. Its cold and ordered spaciousness suits this Batman rather than the elaborate black-rocked cavern warped by centuries that we’ve come to expect. This choice is coherent with where we left Batman last – Wayne Manor was burned to the ground at the end of Batman Begins – and the Nolan brothers rightfully figure that its reconstruction would be proceeding at this time. This example show how meticulous and adventurous Nolan brothers are in constructing every facet evident throughout the production. Imagine how it could look in the third Batman installment! Based on a story by David S. Goyer (Dark City, 1998), the film is briskly paced thanks to the economical editing of Lee Smith. 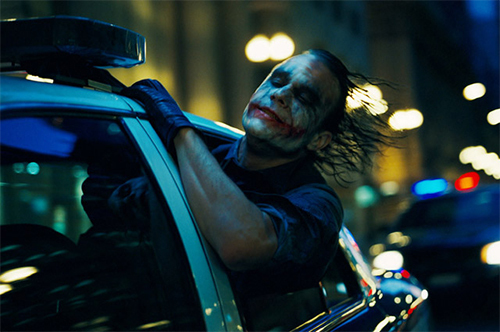 To Christopher Nolan’s credit, he knows when to savor a good thing (for example: Heath Ledger’s performance). Halfway into the picture, a very nerve-wracking countdown that demands an impossible choice and a high speed pursuit is so exciting that a lesser filmmaker might be content to leave it as a climatic denouncement. Christopher Nolan is so generous he’s concocted the means to raise the stakes even higher. The arduous mile taken to film twenty minutes of establishing shots and action sequences using the 70mm IMAX camera is revolutionary for feature films. The clarity of these shots makes the illusion on screen seem strangely tangible. The look of the film by cinematographer Wally Pfister (always employed by Nolan) and production designer Nathan Crowley (The Lake House, 2006) is stellar. 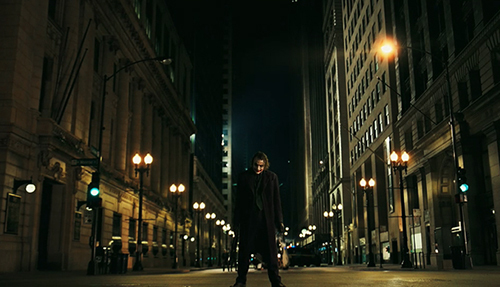 Gotham City, filmed again in the windy city Chicago, is gothic and beautiful with an emphasis of yellow, green, and blue hues at night. The futuristic atmosphere is toned down here compared to Batman Begins with its obvious Blade Runner influences. The camera choices by Nolan are tasteful and exciting. There are deft tracking shots that prove time and again that a moving camera is an involving one. The make-up and visual effects that helped transform Harvey Dent into Two-Face made me grin ear to ear. I love how the suspended bloodshot eyeball twitches and how the jaw and cheek muscles slide behind the burnt flesh. The lead up to the revelation of his face is well handled with a well-timed tease that cuts away to Gordon’s double take (if you’ll pardon the expression). Two-Face is everything I wanted from the deranged, tragic character since I saw his excellent origin story written by Alan Burnett and Randy Rogel in the apt two-parter Two-Face in Batman: The Animated Series. He inspires a walking nightmare – an angel who got too close to the flame. I was struck by the love triangle because the romance genuinely looks like it’s populated with adults. As Rachel Dawes, Gyllenhaal is so striking and lovely with her crooked smile, her laugh-lines, and her empathetic eyes. It’s a real improvement over the baby-faced Katie Holmes who did her best in the first Batman film. Christian Bale is the man – the definitive Batman who interrogates thugs suspended by dizzying heights (I love what happens to a mobster’s ankle) and growls his dialogue with such deep-throated authority. Yes, that’s my Batman. The use of viral marketing over the past year has integrated the film sublimely. For example, those who signed up for news regarding this superhero epic have had e-mails of ‘I Believe in Harvey Dent’ calls to action for re-election. When Wayne criticizes them without displaying a single one in the film, I felt more connected in this world. Having pointed out Harvey Dent’s Win for D.A. and Gordon’s Ambush via Phone. Here, I feel most compelled to point out the coolest plug for my guiltiest pleasure. Finally, the Joker. I love the Joker. I am intoxicated by the essence of this villain. Some of my personality and my artwork has been inspired by this all-knowing character with the sinister grin. Jack Nicolson’s version amused me as a toddler. One of my fondest memories is when I was nine, when my sister took me to a local comics convention and I got to meet Bruce W. Timm and Paul Dini, the creators of Batman: The Animated Series, arguably the best superhero-inspired animated show ever made. When Bruce W. Timm asked me which character I wanted him to draw for me…well, the Joker is framed on the wall to the left of my computer. Not only has Christopher Nolan and Heath Ledger tapped into the spirit of that wonderful Joker, but their reinvention of the character is truly brilliant. The happy bracket scars around this Joker’s sadistically grinning lips brings to mind an image from Ichi The Killer. This Joker was not dropped into a vat of chemicals. He was never the Red Hooded Man or Jack Napier. His origin is lost to an abyss of torture. The fact that this Joker actually applies the white make-up, dyes his stringy hair green, and applies slashes of blood-red lipstick to himself makes him even creepier. His warped identity is driven by choice. 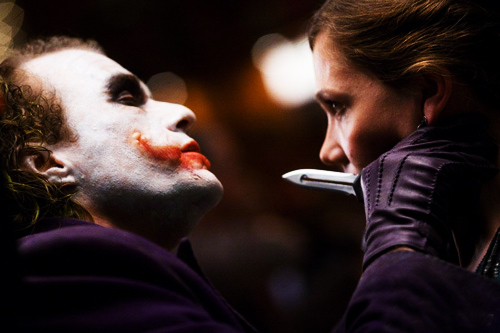 Tragically, we have lost the late Heath Ledger as well as the chance to see him in dozens more unrealized roles, has created a Joker that will be revered for decades. If the Academy chooses to honor the dead, he will be nominated this year, but it is deserving of the lead and not the supporting one. This Joker speaks in a Chicago accent, licking his lips, chewing his words like they were steak. The intent of his diction differs from the trailer so most of the real takes weren’t spoiled. I’ll never forget the way he roars “LOOK! AT! ME!” at an abducted Batman copycat. What’s more is that the Joker is a brilliant terrorist. The Joker’s mind isn’t just screwy, it’s labyrinthine. I love the shot where the camera rotates on the Joker suspended upside-down, just as he finishes explaining his true victory to Batman, he is right-side up but the city behind him is topsy-turvy. The best and most surreal image of the whole film depicts The Joker bombing a hospital in broad daylight and then boarding a school bus. Let’s face it, only the real thing can speak for itself. The comic-book movie genre has crossed swiftly to the elevated acres of great pulp drama. Kudos Warner Bros. It’s a pity that Bob Kane couldn’t have lived another ten years to see this film. 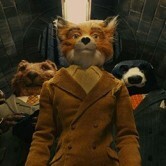 Take a bow, Christopher Nolan, and wow us with a great finale in your Batman trilogy. I think Josh Lucas would make the perfect Riddler, a slithery mastermind with a sinister grin. And who’s to say it’s not too late to throw Harley Quinn into the mix. I’d love to see Amy Adams (Junebug, 2005) in clown make-up turn sociopath. Funny, I always knew that the one to get Batman right would be named Christopher. Looks like the team behind the soundtrack for Batman: The Animated Series was waiting until December 2008. The first volume of Shirley Walker’s score was finally released on limited edition CDs. I write more in depth about it in my piece entitled Shirley Walker’s Contribution To “Apolcalypse Now” (1979). 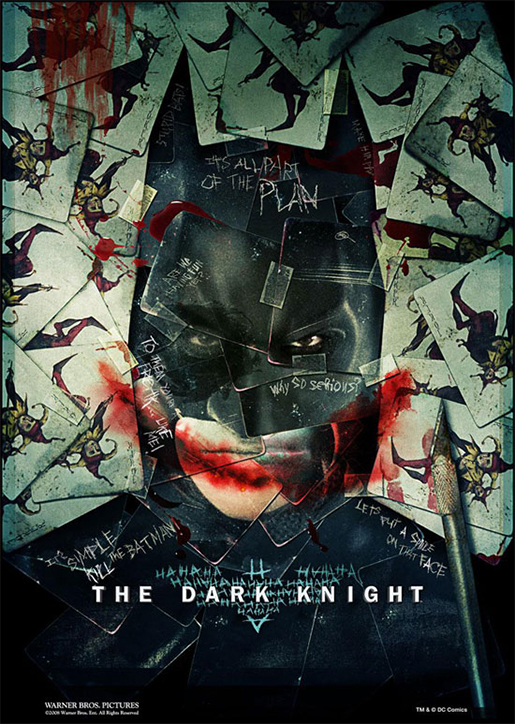 While re-reading this review, I was struck by how the euphoria of The Dark Knight (2008) made me so… optimistic. The truth is that the commercial revenue a film earns is no way to evaluate its artistic quality. Just look at how moviegoers are rewarding Michael Bay’s witless eye-crunch Transformers: Revenge of the Fallen. Last year’s The Dark Knight had more respect for its audience, which seems to have been wasted this year considering where audiences could be going to see instead. There’s Kathryn Bigelow’s The Hurt Locker, Quentin Tarantino’s Inglourious Basterds, Agnès Varda’s The Beaches of Agnès, Armando Iannucci’s In the Loop, and Duncan Jones’ Moon — my overall favourite this year. The Summer of 2009 isn’t suffering for a lack of great movies. 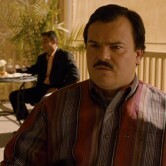 Unfortunately, those attending the movies based on action figurines are getting their full on a spoiled crop.